The KoldLok Surface Mount raised floor brush strip grommet is designed to fit existing cable openings within active raised floor environments. Its split design enables the grommet to be pulled apart and fit around existing cabling coming through the opening. The KoldLok Surface Mount raised floor brush strip grommet is designed to fit in active raised floors to seal cable openings without affecting operations. The KoldLok® Surface Mount unit pulls apart into two halves and is then positioned around the cables, where the double-layered brush strip seals the opening. Based on measurements at multiple data centres, between 50% – 80% of conditioned air is not reaching the air intake of IT equipment due to unsealed flooring openings. This lost air, known as bypass airflow, contributes to IT equipment hot spots, cooling unit inefficiencies and increasing infrastructure costs. By sealing cable cut-outs with KoldLok® raised floor brush strip grommets you can address this bypass airflow, so drastically improving the cooling capacity within the data centre and preventing the detrimental effects bypass airflow has. 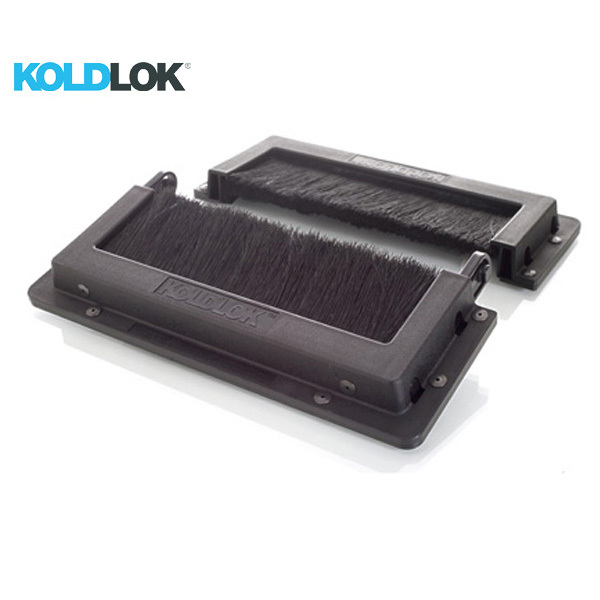 The KoldLok® Surface raised floor brush strip grommet is inherently self-sealing, using multi-layered, different sized filaments within the brush strip which interweave and overlap. The fibres are cantilevered, so forcing them to close. There are over 3,000 filaments per cross sectional inch.